When building an event budget, it is important to consider every element that will go into making your event a success. This can be an overwhelming process at the outset, but our friendly and experienced event coordinators can help you with all the details: from event conception to flawless day-of execution. So what elements go into creating a great event, and what costs should you plan for? 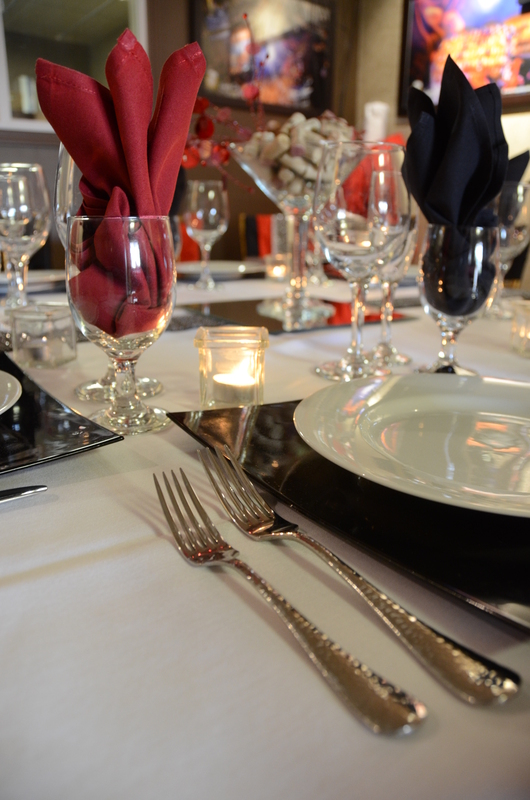 The cuisine will be the main star of your event and will generally take up the largest chunk of your event budget. Plan for a target per-person price for each individual meal, making sure to include costing for appetizers, desserts, and vegetarian or other dietary options. Happy Day Catering has been recognized as Best of the West caterer for nine years running – let us help customize your menu with the freshest, highest quality food around! Don’t leave your guests thirsty! Consider how cold or hot the day will be, event time, location, and the activities guests will participate in to determine what beverages to offer. Budget calculations could include water service, soda or punch, coffee and tea, specialty items like a hot cocoa or Italian soda bar, and alcohol bars. The style, theme, and size of your event determine how much staffing you will need. Consider, Will you pick up your meal and set it up yourself? Will we drop off and pick up your event? Or do you prefer full-service staffing throughout your event? 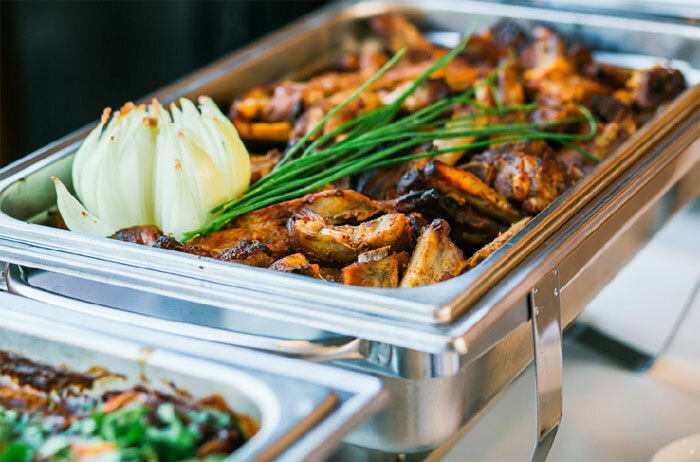 Stations, buffets, and plated meals also require different levels of our professional staffing service, with variable staff-to-guest ratios to keep the event running smoothly. Make sure to include bartenders and labor for setting up or tearing down your event. Longer full-service events will require longer staffing hours. The event length can also impact the food, beverage, and bar services costs in order to keep everyone full and hydrated over the course of your event. 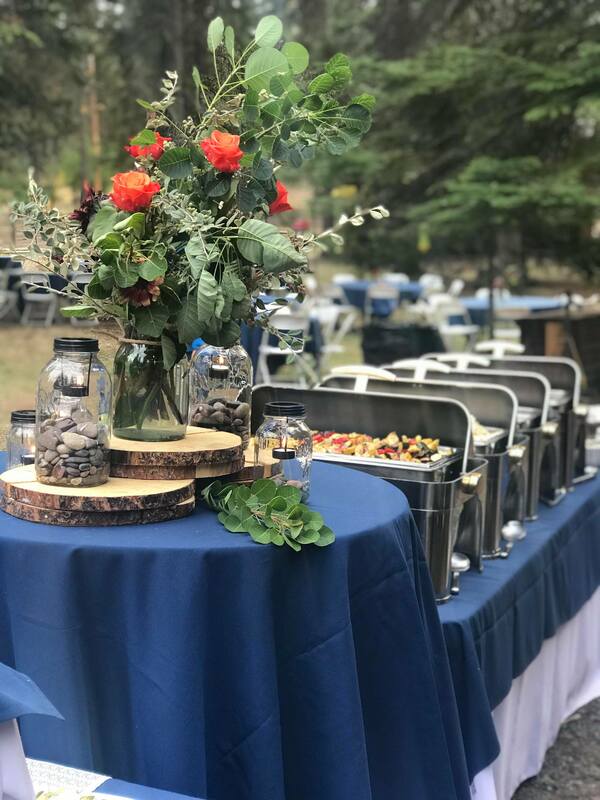 Full-service events with staff on site will incur gratuity and service charges equal to 20%, which account for the planning services of our event coordinators, equipment use, cleaning, and other elements that allow us to bring the best events to you. These items provide the background of your event, projecting the theme and keeping your event accessible. Tables, chairs, and tents are top-of-the-list, but don’t forget to include table settings, linens, florals, and décor items. We offer a wide variety of rentals in-house so you can streamline your planning process from beginning to end in one location. Your special occasion budget may need to factor entertainment in the mix. DJs, performers, gaming tables, and photo booths will have their own costs. If your event will feature speeches, slideshows, or lights, must-have items to make your event a success will include microphones, a lectern, screen and projector, or extension cords. Your venue choice sets the whole tone for your event, so budget appropriately for the perfect space! Rental fees reflect the style, location, day of the week, season, and popularity of the venue, as well as the on-site amenities offered. Some locations will require insurance that may or may not be refundable. Costs associated with event permitting, restrooms, and garbage removal are especially considerations for outdoor spaces. Now that you’ve got the knowledge, let us help to plan the details! Give us a call at (208) 743-0179 to start planning today. It's a lot of pressure to think that you are inviting guests to a party or reception that you are hosting and your expectation to make it the best is on your shoulders!